March 23, 2015 marks the five-year anniversary of the Affordable Care Act. Richard Frank, HHS’s assistant secretary for planning and evaluation, stated during a call with reporters when releasing recent results that "This is an historic drop in the uninsured, and nothing since the adoption of Medicare and Medicaid even comes close." CNBC reports there are now about 26 million American adults without health insurance, compared to about 40 million without coverage just before the Obamacare insurance marketplaces launched in the fall of 2013. Why is it so important to get people covered? If you don’t have coverage your chances for obtaining preventive care drop significantly and the consequences for both the patient and the community are beyond tolling as a result. Diseases are not caught early, chronic conditions aren’t managed efficiently, and the cost of care in late stage or crisis is exponentially higher. The burden of cost then falls entirely on communities and an already taxed health care system, which makes it more expensive for everyone. People without a doubt have a better chance of accessing care if they carry some type of insurance, whether it’s employer, private or Medicaid-sponsored. The uninsured simply don’t have a good chance at seeing a doctor. Take a look at this chart from the Kaiser Family Foundation. Their study showed that even the vast majority of Medicaid beneficiaries have a usual source of care, compared to the uninsured. 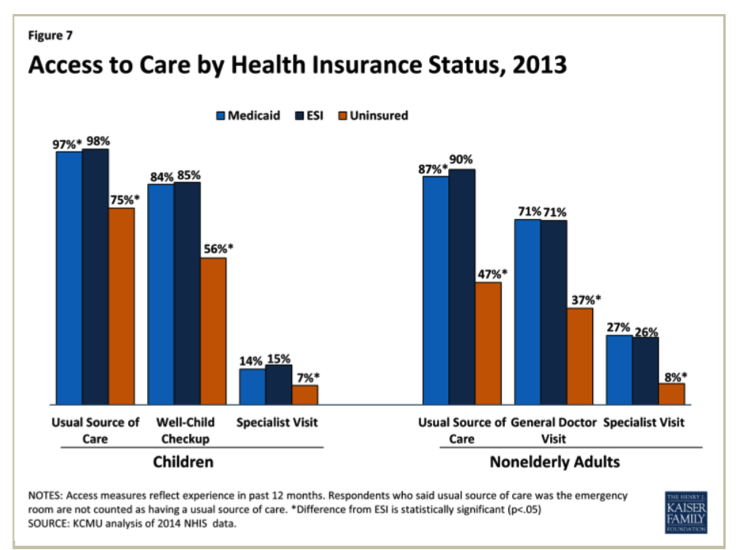 Medicaid patients are also significantly more likely to see a doctor (Figure 7). So if the uninsured are lucky enough to get in to a see doctor there is likely a lack of consistency in tracking their case. The study is quick to note that while Medicaid patients do have robust access to care almost equal to employer-sponsored insurance (ESI) in similar socio-economic conditions, there are studies that show distinct challenges for Medicaid patients in accessing such care. One such study is by the PNHP (Physicians for a National Health Plan). Their study looked at the impact insurance coverage has on catching the top 10 deadliest cancers via the SEER database. It states, “Overall, patients with non-Medicaid insurance were less likely to [have] distant disease (16.9%) than those with Medicaid coverage (29.1%) or without insurance coverage (34.7%; P < .001). Patients with non-Medicaid insurance were more likely to receive cancer-directed surgery and/or radiation therapy (79.6%) compared with those with Medicaid coverage (67.9%) or without insurance coverage (62.1%; P < .001).” There are a variety of factors that come into play when looking at those figures, but clearly your chances are better if you are insured in some capacity versus not being insured at all. When it comes to Medicaid, the potential shortage of doctors providing Medicaid services may be Medicaid patients’ largest hurdle. In January 2015, Modern Healthcare attempted to schedule timely appointments with physicians listed by Medicaid plans and their staff frequently failed. Only a quarter of the doctors offered appointments within two weeks. Half of the physicians weren’t at the location listed, were not serving Medicaid patients at all, or weren’t accepting new patients. Doctors and specialists need to be paid enough to make Medicaid attractive, which is a challenge for states and MCOs who are under pressure to cut costs. If it isn’t financially viable for physicians to provide the care, they simply can’t do it. Location also plays a role in access to care. The distribution of health care workers and transportation providers in rural areas where many low-income Medicaid recipients reside is far lower than in urban cities. Rural locations make getting that patient to preventive care appointments more challenging than it often is for their city-living counterparts. Research conclusively shows that getting the country insured in some capacity with preventive measures in place that are easily accessible is our best chance at not only providing better care for patients and keeping them healthy, but also in regards to reducing overall health care costs. While there are still challenges in getting low-income people the care they need, Medicaid has proven to lower financial barriers to care and those with it fare a better chance of gaining access to care and getting their health care needs met than the uninsured do. If nothing else, the Affordable Care Act has without a doubt gotten more people insured. Can the system successfully shift from crisis care to preventive health in order to serve the masses? It’s likely one of next major hurdles.